Recent struggles forced Mike Brey to have one-on-one time with one of his junior leaders. It was a late night shoot-around with junior captain TJ Gibbs and it was a success and it showed on Sunday night. After a subpar first half Notre Dame’s point guard hit a stride in the second half to lead the Irish to their third win in the ACC. 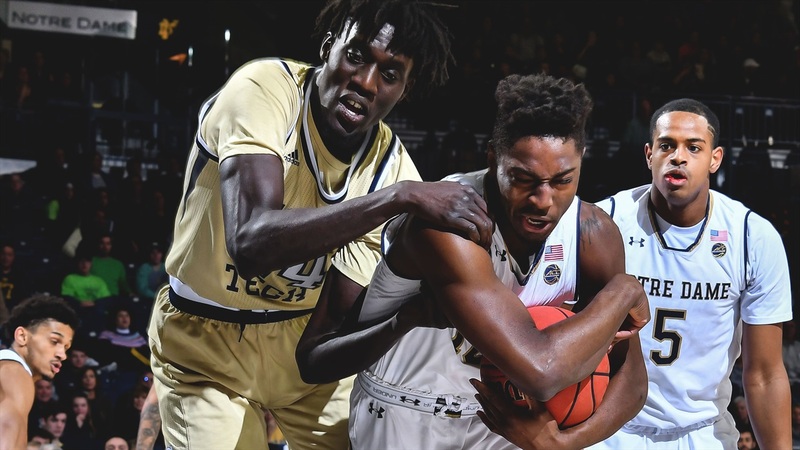 Notre Dame was in desperate need of someone to take control after the Irish continued their poor shooting in the first half against Georgia Tech. Gibbs did just that as he scored 18 of his game-high 20 points in the second half to lead Notre Dame to a 69-59 win over Georgia Tech inside Purcell Pavilion. “It was about the eight-minute timeout in the first half,” Brey explained. “I told our guys we were going to win the ugliest college basketball game in history, but it’s going to be a league win and let’s keep playing. We got into a better rhythm in the second half. I thought we defended and rebounded well enough. Notre Dame improved to 13-11 and 3-8 in ACC play. Georgia Tech dropped to 11-13 and 3-8 in ACC play. The streak of the home team winning the matchup between these two ACC foes extended to eight. Down one coming out of the locker room, Georgia Tech point guard Jose Alvarado converted a three-pointer to extend the Yellow Jacket lead to four, 28-24. 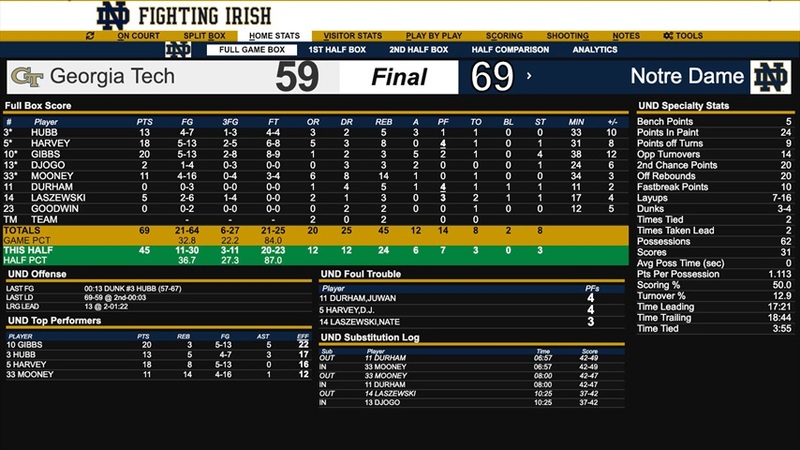 However, Notre Dame was able to take a 33-28 lead after a 9-0 run sparked by John Mooney, Prentiss Hubb and Gibbs converting on free throws, and DJ Harvey cashing a contested three-pointer from the corner. Moments later Georgia Tech was able to score a quick five points to tie it up after Kristian Sjolund hit a three-pointer of his own. Gibbs was able to counter it after a three-pointer of his own after a timeout with 13:54 left in the game and never surrendered the lead again in the game. Notre Dame had control and kept control on the shoulders of Gibbs, Harvey and Mooney. 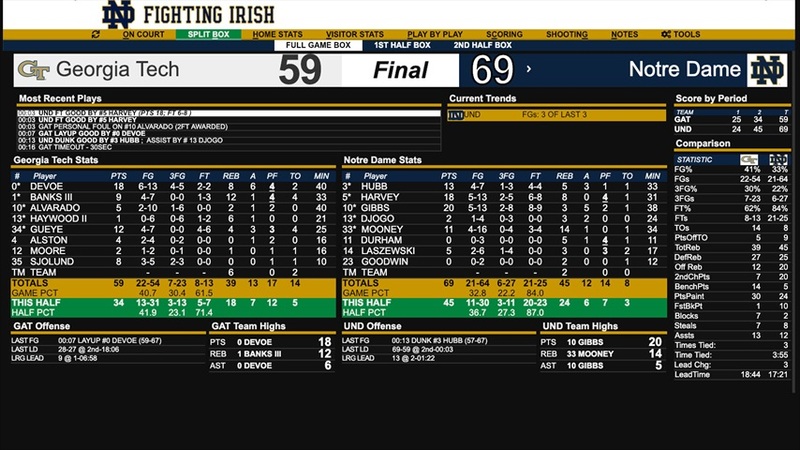 Notre Dame shot just 33 percent from the field (21-64) and 22 percent from three (6-27) but were able to force 14 turnovers and grab eight more offensive rebounds than Georgia Tech (20-12). This was the difference for the Irish, effort. “In the second half, we really passed, moved and cut” stated Brey. “We got to the boards. Our two guards were good with the ball up top all night. You have to be against that. They are hard to score on them. Everyone has struggled against them. Mooney recorded his 15th double-double with 11 points and 14 rebounds. Harvey also added 18 points. Georgia Tech shot 41 percent from the field (22-54) in the loss. Michael Devoe led the way with 18 point, eight rebound and six assists for the Yellow Jackets. Down 17-8 with seven minutes left in the first half, Irish freshman Nate Laszewski brought life to a Notre Dame offense that had been silent for much of the game. Georgia Tech was on a 12-2 run sparked by Devoe who converted on two of his three, three-pointers during the run. Laszewski with 5:51 converted on a three-pointer and moments later threw down a baseline dunk to provide some energy for the Irish. This led to a 10-3 run by Notre Dame to cut the deficit to just two with two minutes left in the first half, after a 3-pointer by Prentiss Hubb, 20-18. Notre Dame tied the game with 49 seconds at 24 when Mooney converted a three the old fashion way. Although going into the locker room, Georgia Tech led 25-24 after Curtis Haywood hit one of his two free throw attempts. Notre Dame shot poorly in the first half. They shot 29 percent from the field (10-34) and 19 percent from three (3-16). Mooney and Harvey led the way with seven points each. Mooney also added six rebounds looking for his 15th double-double on the year. Laszewski added five points and an emphatic block to end the first half to give Notre Dame some life. Georgia Tech shot 39 percent from the field (9-23) and 40 percent from three (4-10). Devoe led the Yellow Jackets with nine points, all coming from behind the arc.